To assign one of the above roles to an operator, follow the procedure for granting access using either internal authentication or SAML authentication. Ops Manager allows multiple administrators to log in to Ops Manager simultaneously and make changes. The interface does not provide visibility to other administrators that are logged in. Pivotal recommends that administrators communicate with each other and coordinate their changes. Only one deployment takes precedence when two administrators try to deploy around the same time. If two administrators are working at the same time, the administrator who first clicks Apply Changes takes precedence. Ops Manager overwrites all configurations made by other administrators during deployment. Pivotal recommends coordinating changes between administrators to avoid overwriting configurations. Note: If you are having deployment issues or changes to your Ops Manager are not persisting correctly, confirm that your work is not conflicting with an automated administrator. In addition to user accounts, you can create a client account to add to Ops Manager. Client accounts manage automation tasks, such as upgrade scripts, log management, and other behaviors that might be negatively impacted if managed by a user account. You can add a client account either before initial deployment or to an existing deployment. For more information about client accounts, see Creating and Managing Ops Manager User and Client Accounts. 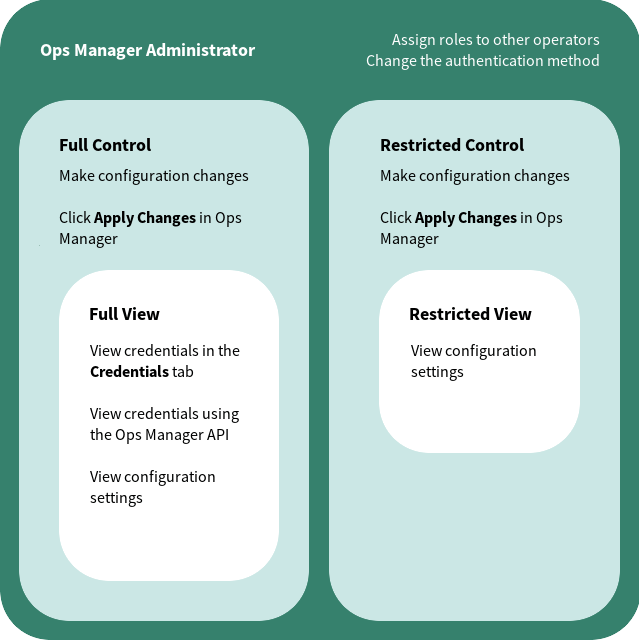 You can assign the roles defined in Roles in Ops Manager to determine which operators in your organization make deployment changes, view credentials, and manage user roles in Ops Manager.